If you enjoy these two recipes, how about sharing the love and passing this post along to your friends? I was so thrilled to get my copy of Nela’s Cookbook. It’s a cookbook written by Nela Rubinstein, wife of famed Polish American pianist Arthur Rubinstein. Her recipes are Polish, Lithuanian, and American. If you’d like to check it out, My Amazon affiliate link is above. I love it. The cookbook, published in 1983, has drawings illustrating techniques, and it’s written as if it were a food blog. Every recipe is preceded by a little story; Nela might talk about the source of the recipe, what she serves with it, or some family chuckle related to the dish. 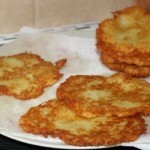 Nela makes her potato pancakes a little differently than other recipes I’ve seen. She uses no flour – preferring instead to use the potato starch that has drained from the grated potatoes. It was the first recipe I tried from the cookbook. I made two different recipes – Nela’s and one found on All Recipes. Before I give you more details, let me say how thrilled I am to have mastered potato pancakes. I’ve been trying to do this for years, only to end up with the a batter that dissolves in the oil. Where did I get the crazy idea that I was supposed to use mashed potatoes? No matter what I added – flour, egg or how I handled the dough – disaster. Not any more. First, I made the recipe that uses flour. Grating the potatoes was time consuming; other than that, it was very easy. Which method did we prefer? Now, we make the basic recipe, the first one below. I do use Nela’s suggestion of grating the potatoes and onion with my food processor. To me using flour rather than relying on collecting the potato starch, just makes sense, it’s faster and easier, and a sure thing. The mixture was just a little more cohesive that the one with only potato starch. If I needed to make the pancakes gluten free, it’s nice to have that option, but it’s an option, I’ll save for special GF occasions. I include it here in case you need GF. You’ll notice in the video that the mixture does get watery as it sits. Just give it a stir and keep on cooking. In this case it also oxidized a bit, turning darker because we took the time to set up the camera, but the color corrected itself as the pancakes cooked. You’ll also see in the video that I turn the pancakes around and over. Before flipping them, I rotate them halfway in the pan because the part in the center always browns faster than the outside edge of the pan. Can you spot the cameo appearance of by Ellie, one of our two new dogs? She and Rigby joined our household a couple of months ago from Bichon FurKids Rescue. Finally, let’s get around to serving these crisp and tender creations. We love potato pancakes topped with Gulasz or Pork Goulash. Polish friends have told me they like to eat them with sugar and cinnamon, or maybe sour cream. How about sour cream and a dollop of caviar? The possibilities are mouth watering. Oh yeah, plain is really good too. I know what I’m going to cook for Sunday breakfast. Both those versions sound good. Which one is in the photograph? The photo is from the first batch with the flour. 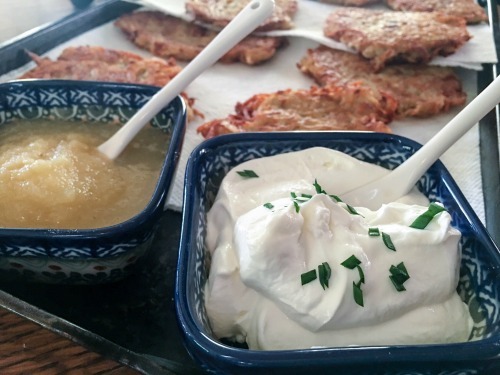 Sorry to tell you but nobody in Poland eats potato pancakes with sour cream or apple sauce. Also they traditionally use flour not starch. 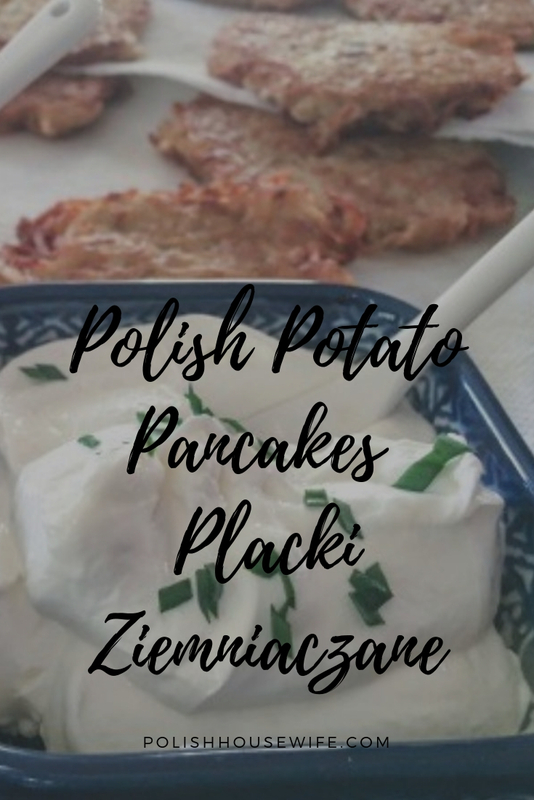 Let’s not confuse Jewish recipes with Polish ! Nobody? That sounds rather absolute, Mariusz. I serve them with sour cream. My dad always ate them with apple sauce. Love them!!!!!!!!!! I haven’t tried with caviar, but I will for sure!! I can’t imagine any topping I wouldn’t enjoy. Thanks for your comment, Loretta! My ,husbands family uses butter and grape jelly. Honestly, they taste great! Sounds good to me, Jackie! Applesauce goes great with them, nice balance of sweet and savory. never heard of ketchup, but I guess since people eat fries dipped in ketchup, it makes sense. I only serve applesauce or sour cream. Laura – did your grandmother show you how to eat pizza in the Polish fashion? With ketchup!!! They’re shocked to hear that everyone doesn’t do that. Boy do I love a good potato pancake–and yours look delicious! There’s a deli in town that serves them with applesauce AND sour cream. So good. these look absolutely delicious – I need to make them for my boys. I’ll let you know how I get on. I recently made these with red potatoes – I added an extra egg and more flour to make up for the lack of starch in the potato. We ate them with sugar and cottage cheese so good I still make them.once in a while. I live in Wisconsin where can I buy this cook book? I think it’s out of print, but you can find it on Amazon. It’s fun reading, enjoy! The photo looks just like the pancakes my mother made. They were the best. I am definitely going to make the first version, well worth the work. We ate them with pancake syrup, Kraft Macaroni and Cheese, yes the blue box kind, and/or Campbell’s Pork and Beans, Was a favorite Friday during Lent no meat cause we are Catholic kind of dinner. The blue box was a favorite at our house too! Food processor all the way!!! This is exactly how my Polish momma makes them, but she cooks in butter instead of lard. Yum!! Thanks for the tip, Nancy! Your first recipe and adding salt, pepper and baking powder is how my mama used to make them. She would let us know when the first pancake went into the frying pan and we would gather in the kitchen. While they cooked we would set the table and get out the sour cream. Mama said they were best a minute after she placed them on a paper towel covered plate! Guests would have first dibs then we would take one. I would get out another frying pan so they would get done faster! I would finish frying so mom could sit down and eat hers with sour cream! My favorite way to eat Mama’s Placki was plain. I so miss making Placki with my mama, she passed March 4, 2015. My deepest sympathy on the loss of your dear mother, Diana. Treasure these wonderful memories. Food is such a big part of family connections. Thank you so much. It’s still difficult being without her because we were like best friends too. Mama was such a fantastic cook. She worked on the weekends until she was 72 for a Polish catering company as their head cook. Parties and weddings for 500 people at times making Kapusta, kielbasa, meatballs, mashed potatoes, baked chicken, roast beef, fish and more! My Nana used to bake a solid version in a black cast ion frying pan, we loved it and can’t find anyone left in our family that had her recipe, then again Nana never did go by a recipe as she only spoke Polish and I never saw a cookbook in her apartment. Has anyone out there made such a dish? We always called it Babka, but apparently that is not what it was. We would eat it with sour cream or applesauce. Yummy and we sure do miss her and her cooking. I think your Nana’s signature dish could rate the name of Babka. 🙂 You certainly could bake this in a cast iron pan (possibly flip mid-way), and sour cream or apple sauce are traditional toppers. Thanks for sharing such a nice family memory. My Mom made this we called it babka too! Same recipe but she added some milk to make it looser and then baked in oven till set. She used a cast iron fry pan but also a deep casserole/soufllet dish. My Dad liked the pan version because she added bacon for him. My sister and I loved the casserole version. Oh my gosh, Marysia, this sounds faster and easier than frying batch after batch! I’ll have to try it! I also had a baked version, and it was incredibly easy and less time consuming. It did not require flipping. I made it in a baking dish rather than the cast iron skillet one day, and my husband commented that they were good, but “missing something.” I’d have to say that “something” was the “magic” a cast iron skillet imparts. I like quicker! I foresee a trip to the oven for my cast iron skillet! I’ll keep my eyes open for it, Chris; you can’t have too many Polish cookbooks! We had these often growing up. Our favorite topping was homemade Concord grape jelly and salt! Sounds good to me, Jane! I’ve never been able to make them not dissolve when using mashed potatoes. I’m glad it works for you! Sounds like a great use for leftovers. Thanks for this post. I also have Nela’s cookbook and want to try my hand at this for Wigilia. Two questions: 1. What kind of potatoes did you use? Would a higher starch potato work better? 2. Do you think attempting to squeeze out some of the water in a dishcloth would help? Hi Heather, I used russet potatoes, I think higher starch is better. I have read recipes where they suggest pressing the water out of the potatoes, as I do for hash browns. You might want to use paper towels pressing. I know the starch will stain purple, and I can’t remember if it washes out. I make the flour version of potato pancakes. I also after draining before adding the flour add onefourth cup lowfat milk to keep the pancakes and batter from turning blackish .keeps leftovers golden crisp dont measure my flour just add till i get consistency i like.delicious with sour cream on top just a dab. I haven’t made these in ages, I made my mother in law’s recipe, never used an onion, egg or pepper! My mom, German and Irish used mashed potatoes, but that was very long ago and I don’t remember if they were good. She just used the side of the grater to mash, drained off all of the liquid and added a few tablespoons of flour and 1/2 teaspoon of salt per potato! I’m going to go through your recipes, but can you tell me if you have a traditional “pigs in the blanket” recipe? Thanks! Hi, Jan, yes I do make pigs in a blanket. Thanks for your comment. My Babci & Mom made this too! It was called Potato Babka. Just fry some diced onion & few slices of bacon, then add that to the potato mixture with some salt & pepper. Rub some lard or oil in fry pan. Pour mixture in and bake at 375 for about 1/2 hr. Then 350 for another 1/2 hr or so till solid in the middle. Hope this helps! Our mother would fry them and my sister and I had to do the grating! Lots of skinned knuckles ! There were 7 of us and boy did we eat some Placki….with sour cream. I think I’m going to make them Sunday afternoon for a football snack! However…not sure of pronunciation but we call them Plotzski???? That would be a lot of grating; yikes! I think you have the pronunciation, Maria. The Polish c sounds like a ts. I make my potato pancakes using crushed saltine crackers instead of flour. And fry them in Crisco (solid in a can). This is how a Jewish friend made his latkes, with crushed crackers! I probably confused the two words. 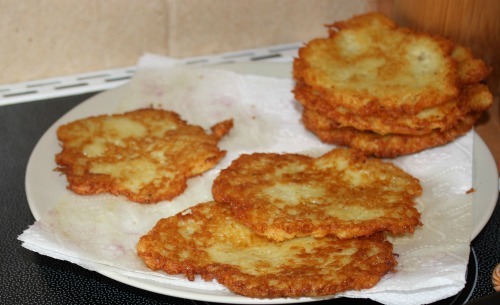 My Slovak grandma also added grated apple to her potato pancakes! So deelish! I remember many a Friday having canned salmon, cottage cheese and potato pancakes. Sounds like a great meal to me! My husband has made these since we were dating. His family puts grape jelly on them❤, don’t judge until you try!!! We would eat them with either Campbell’s Pork & ;sans or mix sour cream with seedless red raspberry jam and put on top. Love eating these!! I’ve had potato pancakes with many toppings but for me it’s a little maple syrup and light salt and pepper. My pleasure, Steve. I think syrup is something I’ll try! I love potato pancakes. I put the potatoes and other ingredients in a blender to chop potatoes and make batter but do not add onions. Use to grate them but the blender makes it easier. I do add about 2 tsp flour to absorb some of the liquid. I have always eaten with sugar. All my grandparents came from Poland and this is how we always ate them. Fried in lard usually makes them crispier too. Sounds great to me, Linda!